Post tornado humor. Here, a doormat referencing the "Ding dong, the witch is dead" song from The Wizard of Oz is placed near tornado damage. 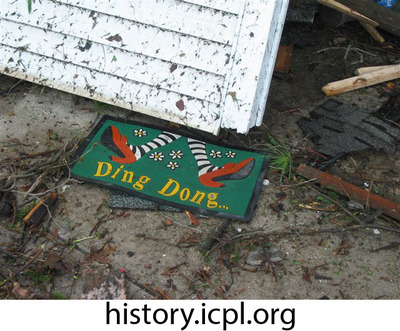 Mellecker, Emily, “Wicked Witch doormat,” Iowa City Public Library, accessed April 19, 2019, http://history.icpl.org/items/show/2663.